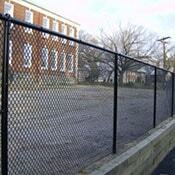 Look into the benefits of chain link fencing. For all the many options for residential fencing, you should have an idea of the benefits for each type. One of the most popular styles of fencing for residences is chain link. It’s durability, security, and cost-effectiveness make it such a great option for many homeowners. If you’re in the market for a new residential fence, here are the benefits of going with chain link fencing. Chain link fencing is constructed with coated steel wires that are woven together to create a system of interlocked chains. They are then bent to create a zigzag formation in a diamond pattern. You’ll usually see them surrounding the front and backyards of many homes in your average neighborhood. Although would-be burglars could climb the wires, they wouldn’t be able to go unnoticed as you would hear them as they try to scale the fence. Furthermore, for added security, many people add razor wiring to the top. You can also see directly through the fencing which makes it impossible for anyone to approach your home undetected. You don’t often see many homeowners having to repair or replace chain link fencing. That’s because they are extremely durable and require little to no maintenance. With a high-quality installation, you can expect to get many years of use out of your chain link fence. They are not susceptible to rotting or pests. The steel is incredibly strong and reliable. Although this style of fencing is incredibly durable and reliable, it’s also quite affordable when compared to other options. You can find other fencing options that are just as reliable and durable, and that provide the same amount of security and classic style; however, being able to experience all those benefits for the price of chain link fencing is highly unlikely. You won’t waste a lot of time waiting around for the complete installation of your chain link fence. Professional installations are quick and easy and come with everything that you’ll need for a high-quality fence. Most chain link installations take place in one day with no need for any follow-up. This entry was posted on Monday, July 23rd, 2018 at 12:25 pm. Both comments and pings are currently closed.